Since “chanting” for Spring didn’t really work–remember last week’s snow episode?–I figure we’ll jump right ahead and try sliding gracefully into summer. I mean, seriously…what have we got to lose ? These little diddies should help—don’t you think? Drop by tablespoons onto wax paper and allow to cool. 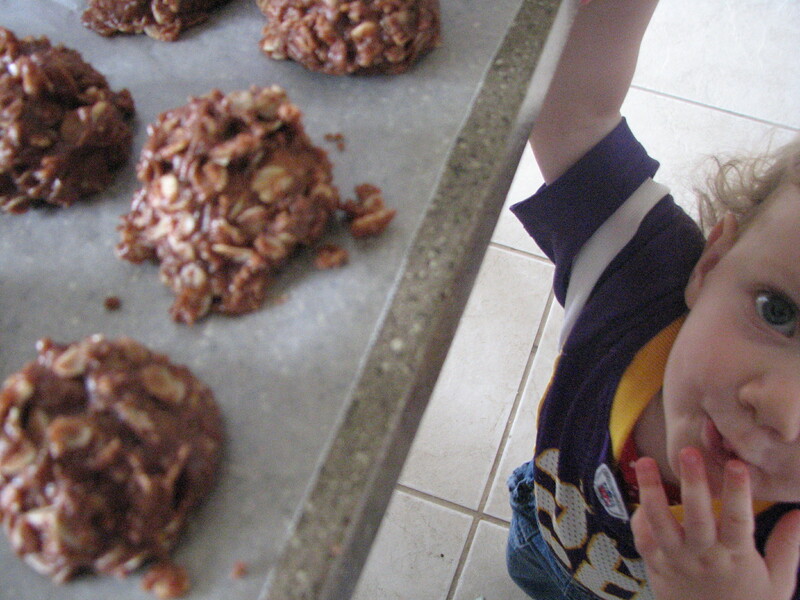 Be on the lookout for cookie tornadoes–they are everywhere and can quickly cause cookie devastation…of sorts. Boil for 1 minute the butter, sugars, salt, cocoa and milk. Did you notice the secret ingredient that we snuck in there? It makes the cookie smoother and more like…fudge. Marshmallow cream! Oooh, that sounds so good. My sister and I used to make a big batch of these and then hide them under our bed to nibble on whenever we wanted over the next week or so! Our poor mom. oh, yeah–it tastes like Fantasy Fudge…with oatmeal. 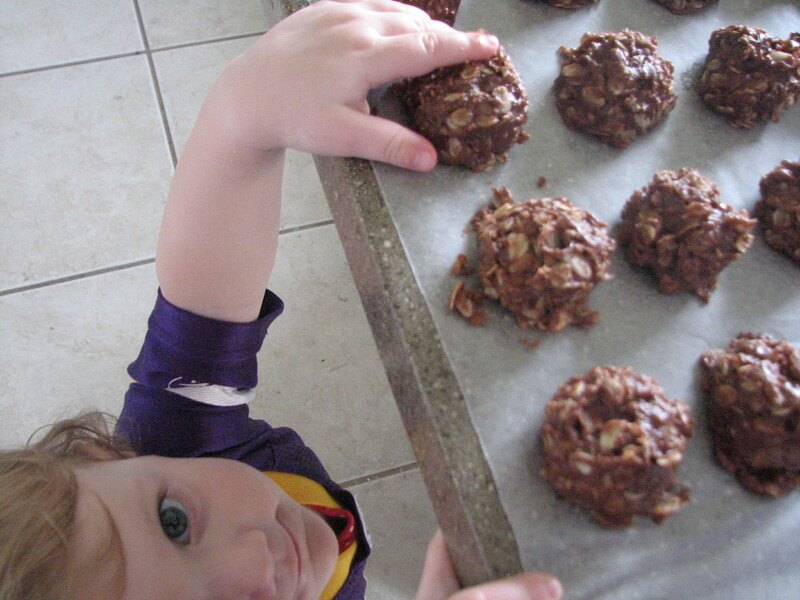 My boys can eat these in one sitting–unless of course I triple the batch…then it takes them a couple of hours. Ha ha! Hey–my friend–we get our boys back next week!!! I’ve always wanted to make these cookies and it looks like I waited until the right time and got the best recipe complete with secret ingredient! Thanks for the recipe! 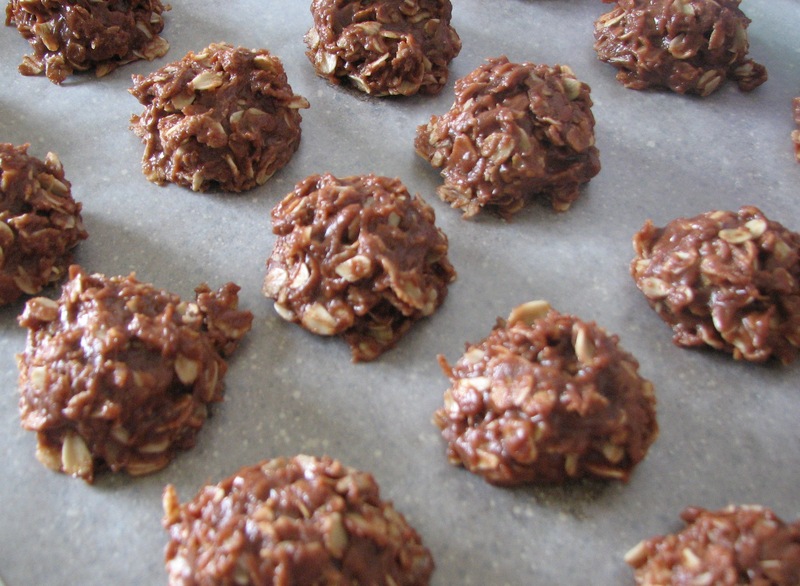 I need to make a batch of cookies for the cookie cooler at girl’s camp next week and was planning to make no-bake cookies. This recipe looks like a lot of fun and I’ll have to give it a whirl. Pray for us young women all over the stake to stay warm and dry next week at Shalom. And it’s yummy–in fact, I’m going to add even more the next time I make it, just to see how far I can push the gooey limit. I love making these cookies. They are best when they are warm. YUM YUM I might make these tonight. Oh, yikes…you guys are brave. It rained us to bits one year–but it was still very fun. We just sat in the tents and played games for 3 days. I actually liked it. I thought it was so cute that she liked them enough to keep swiping them. She’s so cute! What kind of bookmarks? Sounds cool. The date is June 29/30. Pretty sure you’ll be glad you did. My family begs me to make these all the time. Well not all the time. But pretty darn close. These are my favorite cookies. They are the real reason I am now fat. I’ll have to try your recipe with the marshmallow creme. When ever I talk about summer cookies, most people don’t have a clue what I’m talking about. But when I tell how they are made, they then understand why they are called summer cookies. No need to heat up the kitchen with a hot oven. Perfection for summer, and for getting fat.